Publisher: Harpercollins, Scranton, Pennsylvania, U.S.A.
Philadelphia lawyer turned novelist (what a concept!) 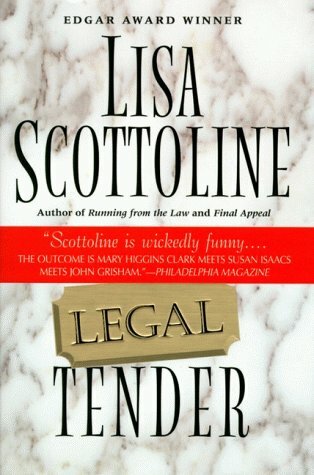 Scottoline has already won a best original paperback Edgar for Final Appeal. Now she might just nail down a hardcover one for her latest book -- a lovely combination of high energy, imagination and nasty good humor mostly directed against lawyers. Her central character this time out is a definite keeper: Benedetta Rosato, "Bennie" to everyone but her mother, a towering blonde who rows to keep her body in shape and duels with the police on a daily basis to keep her legal talents sharp. Most of Bennie's clients have a gripe against the cops, so Philadelphia's finest are less than sympathetic to her cause when she becomes the chief suspect in the murder of her ex-lover and soon to be ex-law partner. Hiding out in a truly original way, Bennie uses (and abuses) a big law firm to help find the real killers; you'll find yourself laughing and gasping all the way.